Featuring luxury damask linens this table was divine.each placesetting featuring colors to accentuate the color palette. Roses and Brides seem to be a given at any wedding. A Brides dream so often revolves around a cloud of tulle and pink roses. This event combined both these and more. 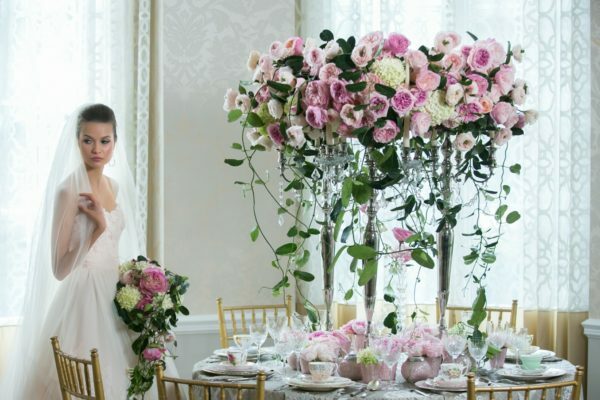 The idea came from the incredible creative mind of Thomas de Bruyne who created this workshop for master florists with Hitomi Gilliam.Known as the European Masters Certification it is available around the world to masters level florists. 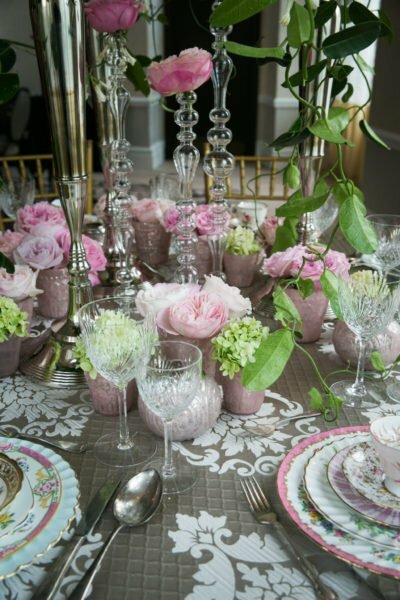 Those of us fortunate enough to be involved arrived at the historic Georgian Terrace Hotel in Atlanta to find acres of David Austin Roses awaiting our ministrations.Furthermore we were fortunate enough to have an expert from David Austin to speak to us on the subject of their new developments.For this table the designers began with the soft taupe silk damask linens of IDOLinens on a round table set in the deep bay window.The next layer was a coordinating napkin of the highest quality.Accent decor provided the small mercury glass containers in soft pinks and metallics to hold individual blooms.The huge silver chandeliers were then filled to overflowing with glorious blooms and trailing leaves. 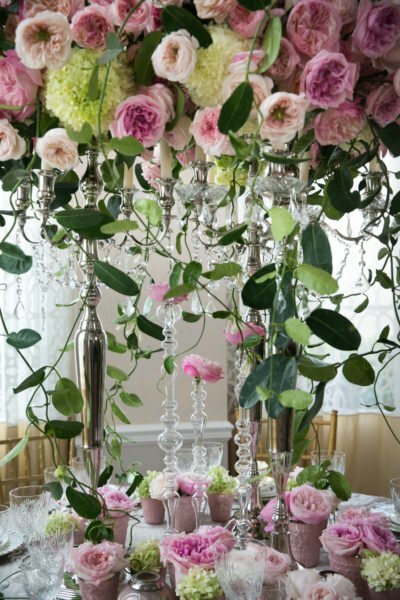 Added next were the tall blown glass vases reaching high to the chandeliers then topped with a blossom. We then stepped in to set the table. I layered some of my softest colors,based on white backgrounds to allow the gentle blooms show. 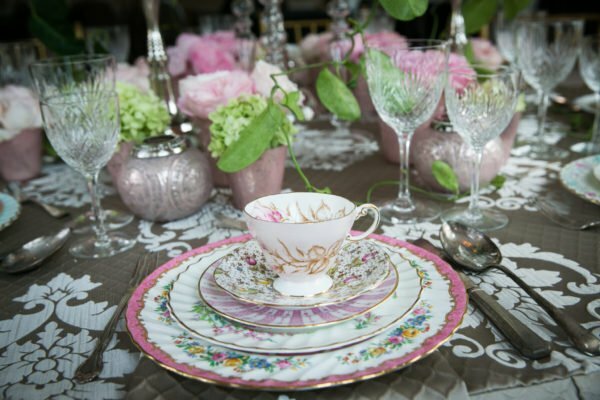 Each fine china plate reflects the colors in the display. 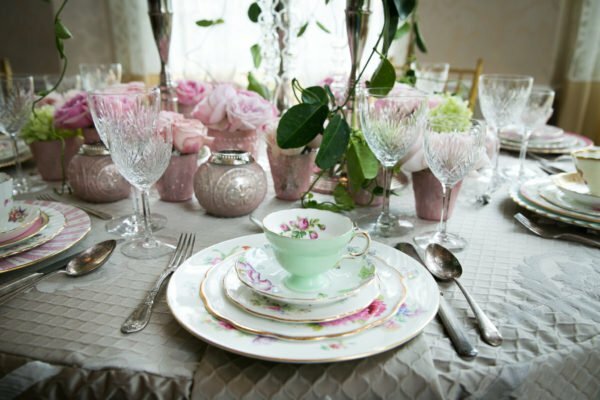 Softest greens and every shade of pink,to compliment the elegance above. I had the most extraordinary morning observing and working alongside these talented individuals.Many thanks to faith Flowers for including me in this epic 3 day event.Our gorgeous model was the icing on the cake,fresh from walking the catwalk in Milan she was everything one would hope for in a fresh and lovely bride carrying yet more roses! 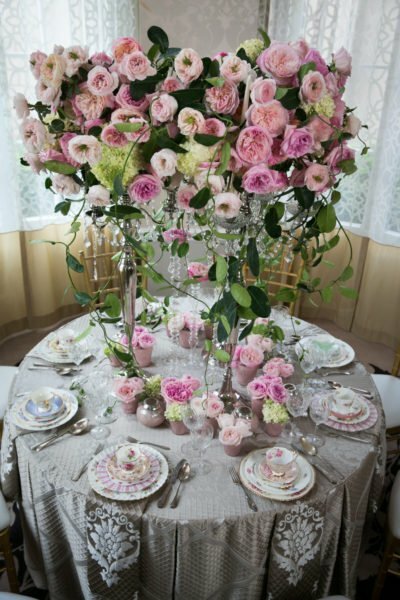 We fulfilled the brief of Brides and Roses to the max with this gorgeous display.